Trolled for a Mahi Mahi and I got lucky to get the hookup on my reel! Overkill for such a fish but it was still very enjoyable putting one of these reels into use! Everything performed perfectly! Thanks everyone! No such thing as over kill when you are trying out a beauty reel that one worked on and built !! Nice fish. That looks like a very pretty way to break in a reel! Very nice! Nice. Fresh Dolphin tacos sounds good to me. Way to break her in there, Andy! Sometimes they get Skull dragged. You brought a Machine Gun to a knife fight. The boat had nothing but stock 9/0’s and as we walked down the dock everyone had the same in their boats. Seems to be the standard. Could have been a lot more fine if I hooked it on the narrow 4/0. Oh well there is always next time. 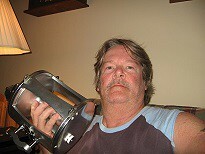 Good work Andy, your reel looks great, glad you caught a nice fish with it, and maybe many more, thanks & cheers Don.